When my sons get animal toys- Duplos, Megabloks, Playmobil- I save the boxes, and cut the pictures out for playing games. I originally put them in a tin for my older son to play with while I cooked dinner. I thought he would love it…and it fell totally flat. The tin sat in the drawer in the kitchen, slowly being pushed to the back, for years. While cleaning with my 1 year old recently, I pulled them out to recycle. He picked up one of the cutouts, then ran over and picked up the matching animal. He came back to me, with a look of pure delight in his eyes. 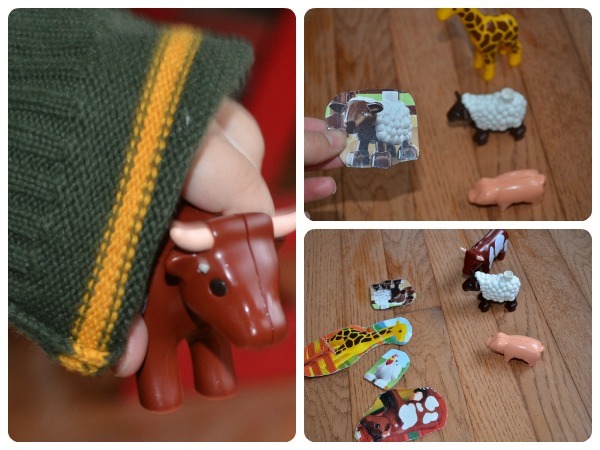 Animal line-up: I line up the animals, and hold out one of the cards. Then I ask him to find the corresponding animal. 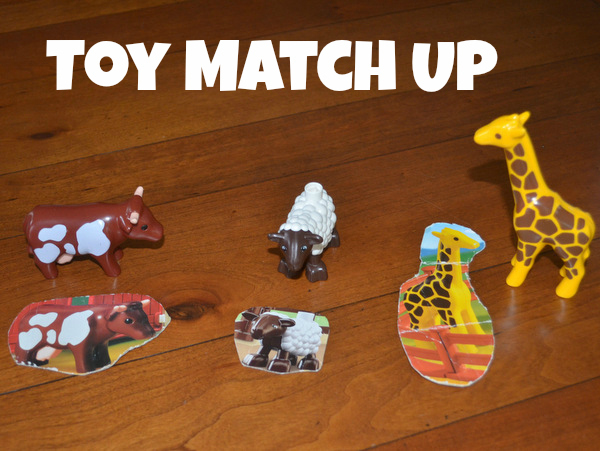 Matching: We lay out the cards and the animals, and match them up. Feel and Guess: When my 4 year old wants to play, I have to make it a little more challenging. I hand him a card, and he closes his eyes and feels each of the animals until he finds the one on his card. Looking for more baby and toddler play ideas? Check out Zero to Two: the book of play, an e-book I co-authored! It includes 25 step-by-step tutorials with pictures, as well as links to over 50 more ways to play with babies and toddlers – all for $8.99. Thank you for stopping by! Join in our fun by subscribing, or connecting on Facebook and Pinterest.